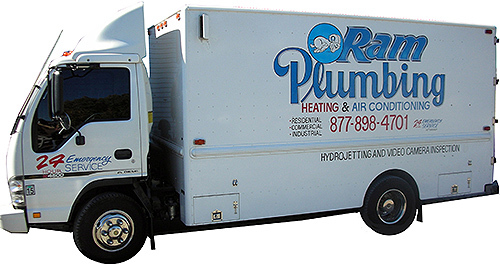 RAM Plumbing Heating & Air Conditioning is your one stop plumbing, heating and air conditioning provider. We have established ourselves as leading and reliable providers of plumbing, heating and air conditioning services to residential, commercial, and industrial clients. We offer experience, expert service and no plumbing job is beyond our range - we can take care of any plumbing or heating/air conditioning need you may have from routine upkeep to major emergency repairs. Our superbly trained plumbers are ready for all emergency plumbing situations 24/7. Our services include drain and sewer cleaning (toilet, kitchen, shower, floor, & main sewer lines); air conditioning installation, service, and repair; hydro-jetting; rooter service; trenchless sewer line replacement; backflow testing, service, and repair; regular and tankless water heater installation; video camera inspection (sewer, pipe, & drain); water and gas leak detection; sewer ejector pump; and smoke testing. We service the entire Inland Empire including Corona, Norco, Eastvale, Riverside, Lake Elsinore, Temecula, Chino, and Chino Hills.